Root structure is generally poorly studies in comparison with that of the stem or leave of the same plant. All roots are composed of the same tissue systems as are found in the stem and leaf; namely dermal, the fundamental or ground, and the vascular systems. Roots are divided into a cortex or outer re4gion, and a stele, or inner region, which contains the vascular system. The images to the right show some common cortical root variations. Nearly all roots have root hairs (C) which grow nearer the growing tips of the young roots. The dermal system is typified by the epidermis This structure may be modified dependent upon environment and particular adaptations that may take place during the life of the root system. Root hairs (C) For example an hypodermis may be present beneath the epidermis. This layer is in effect, a mirror image of the epidermis, and serves principally, as an additional protective layer. Aerial roots undergo considerable modification to allow uptake of water through a specialized compact multicell layer, called the velamen (E), as shown in many orchids. The cortex too, is highly variable, and this is often dependent upon the environment in which the roots are anchored. For example, in hydrophytes or in plants growing under damp or boggy conditions, as in the the cortex of the rush (A-C) often contains and extensive intercellular space system, (lacunate, B) to accommodate gas exchange. In contrast to the rush, the orchid contains a solid cortex (F). Fig. 1. Roots in T.S. 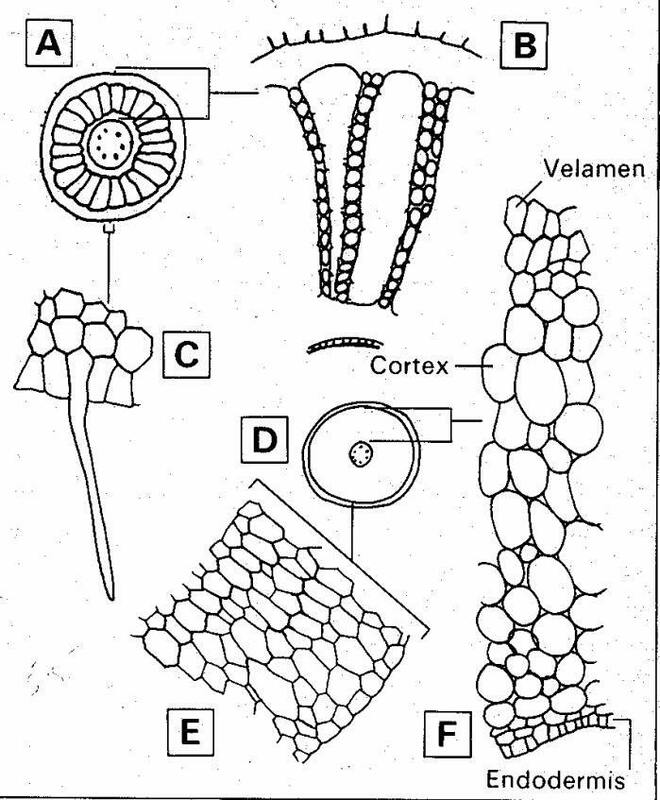 A-C Juncus acutiflorus, A, diagram; B, lacunate cortex, C, root hair, D-F Cattleya granulosa, D, diagram; E, velamen F, ‘solid’ cortex. The cortex has two recognizable boundaries. Both serve important physiological functions associated with the uptake and transfer of water and dissolved inorganic and organic molecules. Whilst the epidermal layers are chiefly concerned with uptake, it is the innermost boundary, the endodermis, which is perhaps the more important layer. The endodermis is often striking, due to its thickening as well as the presence of Casparian strips. The combination of these two specific modifications, form effective barriers to unregulated transport. The endodermis of the Iris root forms a near-impenetrable layer, with transport across this interface, regulated by specialized thin-walled passage cells (shown above) which, as their name implies, allow symplasmic as well as apoplasmic transport from the cortex to the stele, and vice versa. Fig. 2. Some root vascular systems.. A, Ranunculus acris tetrarch root. B, Echinodorus cordifolius diarch root. C, D, Juncus acutiflorus polyarch root. 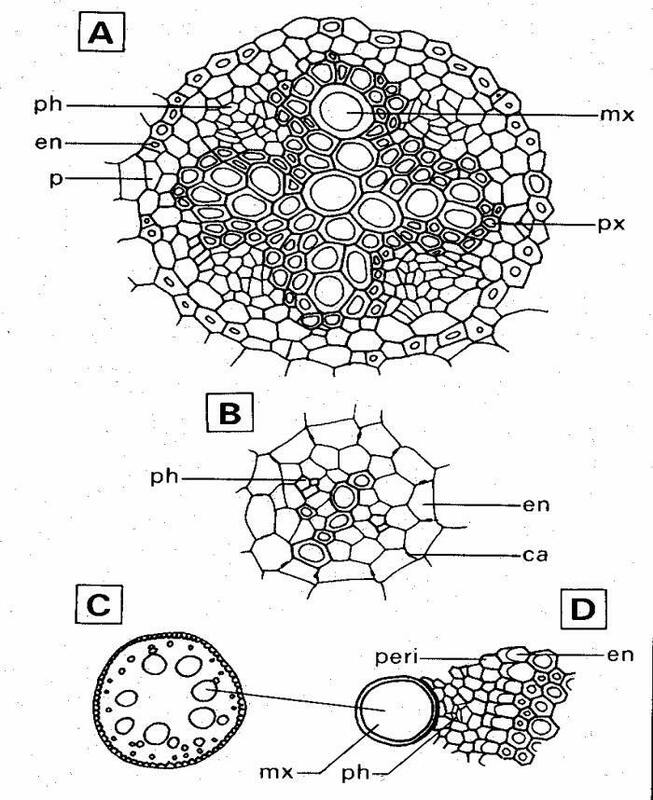 ca, casparian strip; en, endodermis; mx, metaxylem; p, passage cell; peri, pericycle; ph, phloem. All roots have a central vascular system, which, in the young system, is composed of primary xylem and primary phloem. The boundary between the cortex and the stele is illustrated in the micrograph to the left, and is f ormed by a thin-walled cell layer, termed the pericycle (P) . The pericycle is a generative layer, in which lateral root initiation commences. The pericycle is on the inside (endarch) of the endodermis (E). 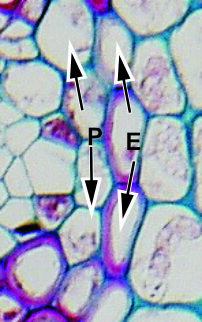 The vascular tissue occurs endarch to the pericycle, and is composed of a number (two to many) strands of xylem, alternating with the same number of phloem strands. Various root anatomies are illustrated in Fig. 2 above. The young dicotyledonous or gymnospermous roots are similar in cross section to each other, with the one obvious exception, that gymnosperm roots lack vessels. Can you think of other differences between gymnosperms and dicots? The centre of the root may be made up entirely of xylem in the dicotyledon, or in monocotyledons or dicotyledons it may contain a ground tissue composed of parenchyma with thin or thickened walls, sometimes termed pith. mechanical tissues, such as sclereids could be present.